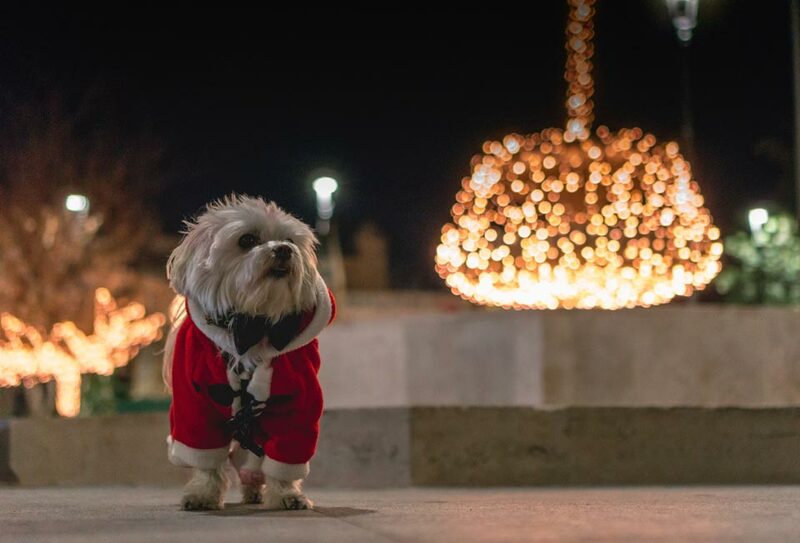 Food and decorations that light up our holiday spirits can be dangerous for our fur babies. Here, what you need to know. Avoid sharing food from the holiday buffet. Anything rich or fatty can cause an upset stomach or a more serious illness such as pancreatitis which can cause severe pain, vomiting and dehydration. Uncooked meat, fish, and poultry can contain disease-causing parasites and bacteria, such as E. coli. Poultry bones are also a risk for choking or if swallowed, tearing your pet’s intestinal tract. Another definite no-no is alcohol. While many pets are attracted to sweet drinks, especially egg nog, alcohol is extremely toxic. In fact, hundreds of dogs and cats die annually from alcohol consumption. Tobacco products can also be fatal, if ingested. Signs of poisoning develop fairly quickly, usually within 15 to 45 minutes, and include excitation, salivation, vomiting, and diarrhea. Pets can also develop seizures or cardiac arrest. Cigarettes, cigars, tobacco, nicotine gum and patches, and ashtrays should always be kept out of reach. Yet another risk comes from the sweet table. Chocolate, coffee, and tea all contain a dangerous substance called xanthines which can cause nervous system or urinary system damage and heart stimulation. — Uncooked yeast dough. It can actually expand in your dog or cat’s digestive system, causing pain and possible rupture of the stomach or intestines. — Grapes and raisins contain a toxin which can damage the kidneys. — Macadamia nuts are also toxic and can affect the digestive and nervous systems and muscles of your pet. And remember to clear all plastic or aluminum foil food coverings from countertops. Meat-soaked strings, a tempting nibbly for your pet, can cause a surgical emergency called a ‘linear string foreign body’ in the intestines. Finally, be sure to pet-proof all garbage. — Puppies and kittens, in particular, have a natural instinct to chew on things. Make sure any exposed wiring from holiday lights is taped down or hidden to prevent electrocution or shock. — Cats often see trees as a fabulous climbing adventure. Remember to position your tree somewhere stable in a flat, wide base. Besides the obvious risk of damaging any breakable ornaments, a fallen tree can injure your pet. — Go tinsel-free. While tinsel could pass through the digestive tract of your pet, there is no guarantee that it might not do further damage. — Glass ornaments can shatter and the pieces can easily cut paws or become a strangulation hazard. Hang the breakable items higher up on the tree. — Avoid decorating your tree with popcorn or cranberry strands or other food that may tempt your pet. — Make sure your pet does not have access to Christmas tree water. Cover the bottom of the tree with a skirt or cover. Tree water may contain fertilizers, which can cause stomach upset. Stagnant tree water can also be a breeding ground for bacteria, which can lead to vomiting, nausea or diarrhea. All the glittery wrappings — ribbons, yarn, bows and string — can cause intestinal obstruction and bunching of the intestine if ingested. These conditions require surgery and can be fatal. Ribbons and bells tied merrily around your dog or cat’s neck may be cute, but they can also be dangerous. Adhesives and glues can be toxic and are often attractive to animals. Other potentially dangerous items include ornament hooks, batteries, and Styrofoam. The festive plants of the season — poinsettias, mistletoe, ivy and holly berries — should be kept out of reach. If eaten, these holiday plants can be poisonous and even deadly. Potpourri also contains oils that can be toxic to pets. And just as you should not leave candles unattended around children, the same rule applies to our four-legged friends. For more information on keeping your pet safe this season, visit www.peteducation.com.